An astonishing number of Members have represented their countries in International contests or at Olympic Games. This 12-page booklet was produced for the the Club’s Inaugural Sports Lecture & Dinner held at Lord’s on 30 March 2017. Only five sports are included – Athletics, Cricket, Hockey, Rowing and Rugby Football Union – but hundreds of athletes are listed. 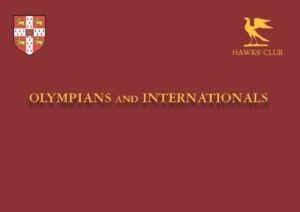 This A2 sheet can also be downloaded for close scrutiny… Not all the athletes shown were Members of Hawks’.